"Yeah, you're hearing that right." That about sums up the response women—especially black women—often have to give whenever people express shock to find out that they're engineers. 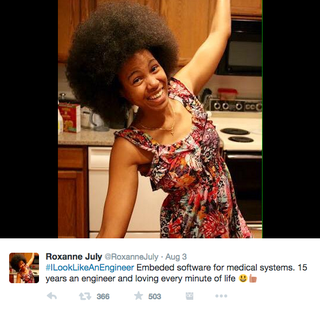 So it makes sense that the #ILookLikeAnEngineer hashtag on Twitter went viral. Female engineers have been posting photos of themselves to discredit the idea that all engineers are men and also white. It all started after commenters didn't believe that a female engineer who appeared in an ad was, in fact, an engineer. They thought that maybe the woman was a model.